Even with the advances in signal processing and digital communications, robustness to uncertain channel statistics continues to be a fundamental issue in the design and performance analysis of today's communications, radar, and sonar systems. The variability of digital communications systems consistently challenges the communications system designer, while new applications have channels that almost defy accurate modeling. As a result, parametric detectors, which are excellent when model assumptions are satisfied, do not maintain the satisfactory performance necessary for detection. 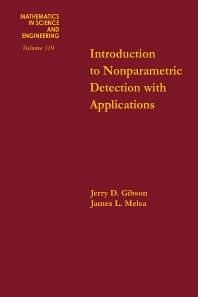 This core IEEE Press reissue is the only book devoted solely to nonparametric detection - the key to maintaining good performance over a wide range of conditions. Throughout, the authors employ the classical Neyman-Pearson approach, which is widely applicable to detection problems in communications, radar, sonar, acoustics, and geophysics. Topics covered include: nonparametric detection theory, basic detection theory, one-input and two-input detectors and performance, tied observations, dependent sample performance, and engineering applications.